2While Congress remains overwhelmingly Christian, the number of non-Christian members has risen to 63. Most non-Christian members of Congress are Jewish (34), but there are also two Buddhists, three Muslims, three Hindus, two Unitarian Universalists, one unaffiliated member and 18 who decline to specify a religious affiliation. Only two of the non-Christians – Jewish Reps. Lee Zeldin, R-N.Y., and David Kustoff, R-Tenn. – are Republicans. The rest are Democrats. 3The largest change in the new Congress comes in the “unspecified/other” Protestant category, which gained 16 seats. (“Unspecified/other” Protestants include those who say they are Christian, evangelical Christian, evangelical Protestant or Protestant, without specifying a denomination.) Presbyterians and Anglicans/Episcopalians lost the most seats in the new Congress, with each losing nine. 4There are fewer Christians in the incoming freshman class than there are among incumbents. In the new Congress, 96 freshmen will join 438 incumbents: the largest freshman class since 2011, when the 112th Congress was sworn in. While the share of Christians among the freshman class is still higher than among the general public (81% vs. 71%), it is lower than the share among incumbents (90%). Among the new members are the first two Muslim women in Congress, Reps. Rashida Tlaib, D-Mich., and Ilhan Omar, D-Minn.
5Both chambers of Congress have roughly similar shares of Christians and non-Christians. But within those categories, there are some differences, particularly with regard to Catholics, who make up 32% of the House, but just 22% of the Senate. Additionally, all of the Muslims, Hindus and Unitarian Universalists are in the House. Correction: A previous version of the report’s dataset had the wrong member of Congress listed for California’s 21st District. Freshman Rep. TJ Cox, a Catholic Democrat, represents the district. Item No. 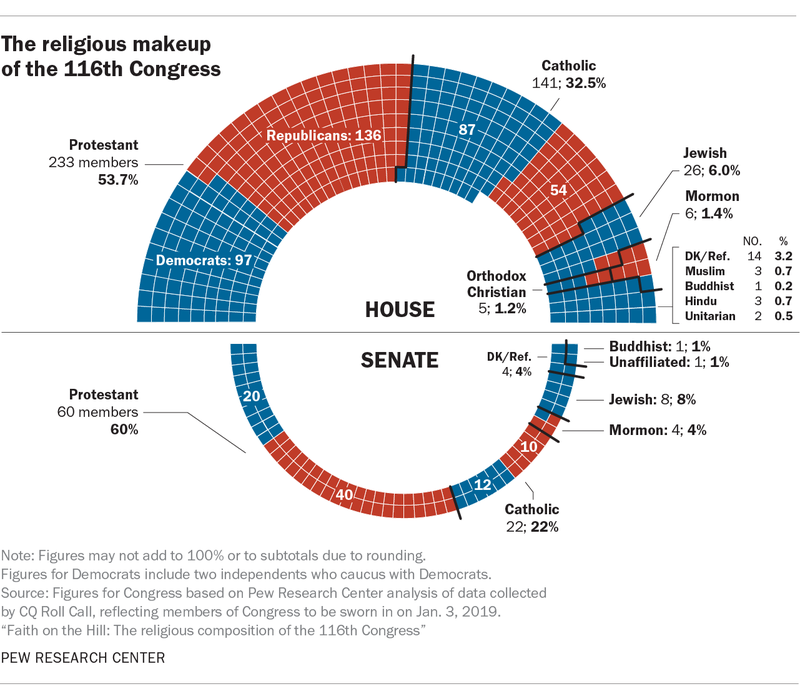 4 of this post and the chart “The religious makeup of the 116th Congress” have been updated to reflect this correction.